These breathtakingly beautiful treviso radicchio were on offer from Fishbowl Farm at the Portland Farmers’ Market last week. As gorgeous as they were, I was having a hard time getting an image I loved of them. I had two perfect cabernet-colored heads lined with sensational lime green veins and yet I just couldn’t quite get a photo that did them justice. I finally surrendered and sliced them open for the grill. Salt, pepper and a dash of olive oil and they were ready to go. I placed them in a pan and headed out to the grill staring at their beautiful innards, and suddenly realized THIS was the photo. The worn pan, the way I had put them in it, the interior colors, everything was just right. So dinner was delayed another few minutes while I took this shot. It was a good reminder that sometimes you can’t force a photo, that the stars might align when you’re simply going about your business. The trick is to always be aware so that you don’t miss that golden opportunity! This entry was posted in food and tagged food photography, food styling, treviso radicchio on August 4, 2009 by Stacey Cramp. I love your thought behind this photo Stacey. 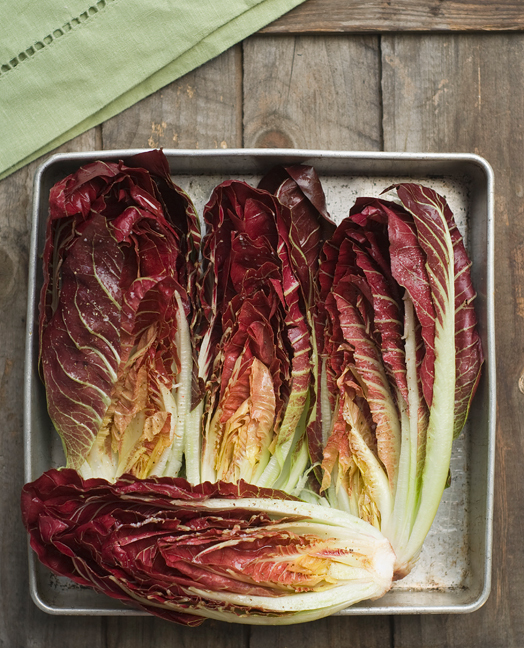 The thought, the radicchio and the photograph are beautiful! !